Secure this harness to any chair to give your tot a seat at the table. Strollers, snacks, diapers, toys. Kid-friendly outings entail lugging around lots of gear. During your next mealtime excursion, leave the portable high-chair behind and opt instead for this lightweight design. 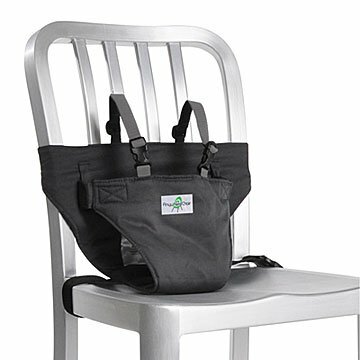 A five-point harness with adjustable straps, it compactly folds into its own carry pouch and can be lengthened or tightened to fit most chairs, both wide and high. If your kiddo is a squirmer, it can also be used on an adult's lap for hands-free holding. Machine-washable and designed for tots aged six months to 2 1/2 years. Made in China. 6 months to 2 1/2 years. Child must be able to hold head up to use. Machine wash warm/cold. Lay flat or hang to dry. This was a great compromise - the little gets to securely sit, and see the world, I can use 2 hands to eat. I would suggest setting up a practice fitting before going out - there are quite a few buckles to adjust to fit (which felt like an eternity to fiddle with a hungry little). The carrying case works great to contain the straps and fits easily into the diaper bag. Helpful for a Brooklyn Baby! It would be great if you could order several goods to be packaged as a gift together.